– Painting: we’ve painted the pilothouse, all of the burgundy trim including the rubrails, and are now working on the masts. – Navigation: we’ve updated our navigation PC, and switched to a new navigation program, OpenCPN. We’ve tracked down lots of charts which work with this new program, including some which are derived from GoogleEarth satellite images. (We hope these will be useful to identify coral heads when navigating the Polynesian atolls.) We’ve installed a new radar, wind instrument, and AIS (uses VHF radio frequencies to communicate with nearby ships to identify *and avoid* potential collisions). The data from all of these is combined and displayed on one screen using our new navigation program. We’ve also installed a new satellite communication device which will allow us to get weather data and forecasts daily, which can also be displayed on that same screen. This satellite device (called an Iridium GO) will note our position hourly and will update our position and track at: http://forecast.predictwind.com/tracking/display/Lungta (note that the capital ‘L’ is very important!) We’ll be able to send and receive text messages and even some email. – Visas: we’ve applied with the French embassy in Panama City for long-stay visas to French Polynesia. If we didn’t do this, we would be limited to a three-month stay, but once these applications are approved and inserted into our passports we should be able to stay up to a year. The more we hear and learn about French Polynesia, the more we want to extend our travel time in the South Pacific. As so often seems to be the case, our anticipated trajectory seems to be lengthening and slowing down. It now looks likely that we’ll spend more than just one season crossing the Pacific. We don’t yet know where we’ll spend the cyclone season this year, but it will probably not be as far west as New Zealand. 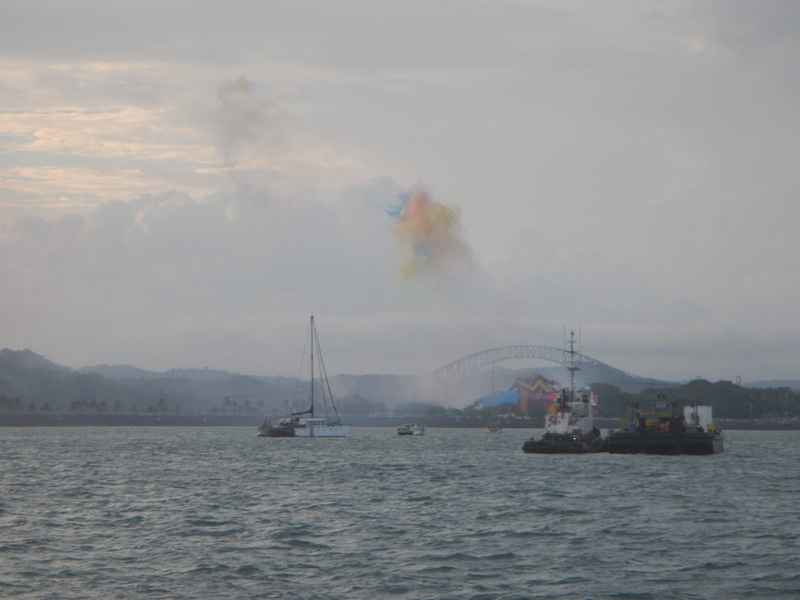 And after French Polynesia, there are a number of other island nations that are worth a potential visit as we hop our way the rest of the way across the Pacific – Fiji, Tonga, Samoa, Vanuatu, etc. 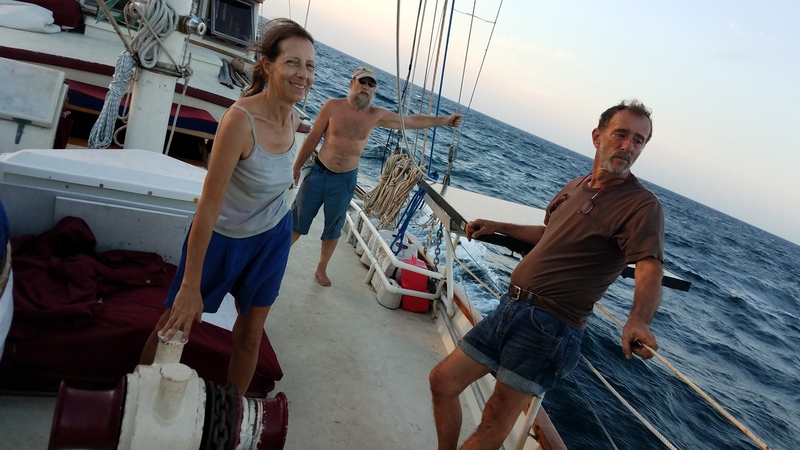 – Crew: we’ve found two wonderful crew mates, and life is good. Dave joined us in October (along with Keith and a few of his friends), allowing us to leave Lungta in his capable hands while we visited our families in the States. 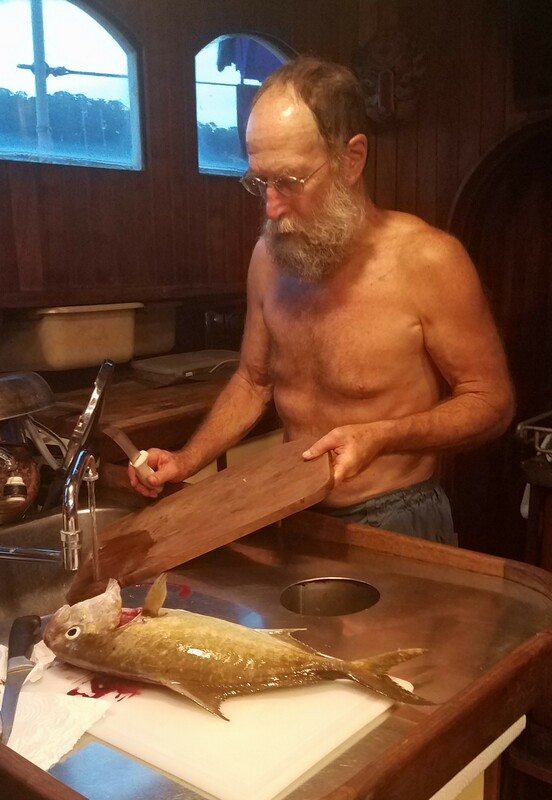 Dave had a long career on the water as a pilot boat captain and various roles on training schooners. Laura arrived two weeks ago from Copenhagen, fresh out of medical school and with a surprising amount of international travel already under her belt. Both are vibrant, engaged, thoughtful people who are delightful to be around and we expect will continue to be so for the upcoming 4-6 weeks at sea. We don’t “need” any more but we have one more bed that could be filled, either with an individual or a couple. We’ve received messages from many interested people over the last several months, and we’re so touched at the outpouring of interest. We’ve had deeper conversations with dozens of them to find just the right mix. It’s getting close to time to close that door, but we haven’t stopped yet. Because we have an infinitely long to-do list, we have to balance that work with time off for fun. But don’t worry – we’ve also had a few adventures in this same time frame. Our friend Suzanne came for a visit, her third (so far). 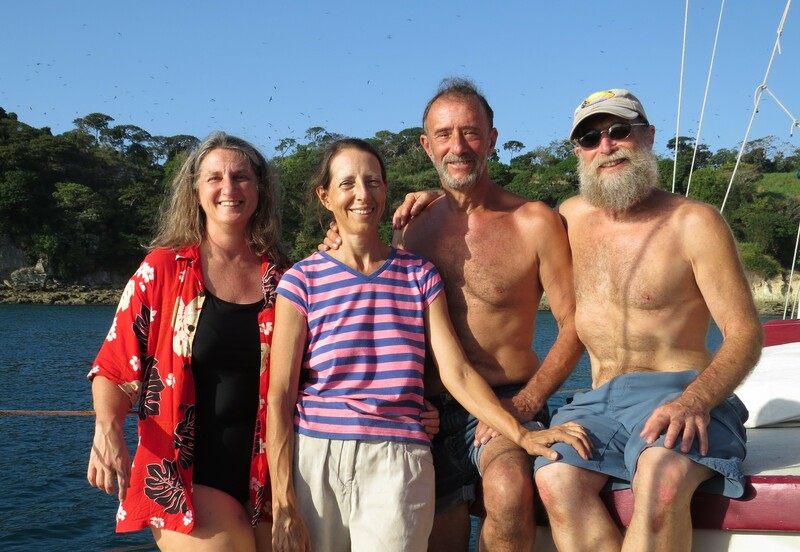 We spent a few days out at the Perlas islands again. On the way we put out a fishing line with a brand new lure on it. We had purchased a fancy reel from another boater, who had included this lure with a sweet request to let her know what we caught with the set. As we were nearing our first night’s destination, a fast-moving ferry catamaran overtook us but changed directions near the last moment. This caused him to cut across our fishing lines that were trailing behind, and indeed he snagged our new lure and it was eventually lost. We didn’t land that fish, but it was a BIG one! 🙂 Our first afternoon in our private anchorage, two young men in a panga drove up on the beach and poked around the bushes and trees for a while. We kept trying to figure out what they were doing: taking a pit stop, preparing to camp overnight, taking the dog for a walk? They didn’t stay long, though, and then they came immediately to Lungta – with newly harvested coconuts for sale! Yum! Suzanne swam ashore another day, “just because”, and had an uninhabited tropical island completely to herself for a while. We enjoyed fishing from the dinghy just before sunset one evening, and had the freshest fish ever for dinner! We left the Perlas so that Dave could catch a plane to visit a friend in Mexico, so we had Suzanne to ourselves during her last few days with us. Kathy and Suz spent the next two days seeing some of the sights, so that Suzanne would go home having seen some of the “real”Panama. 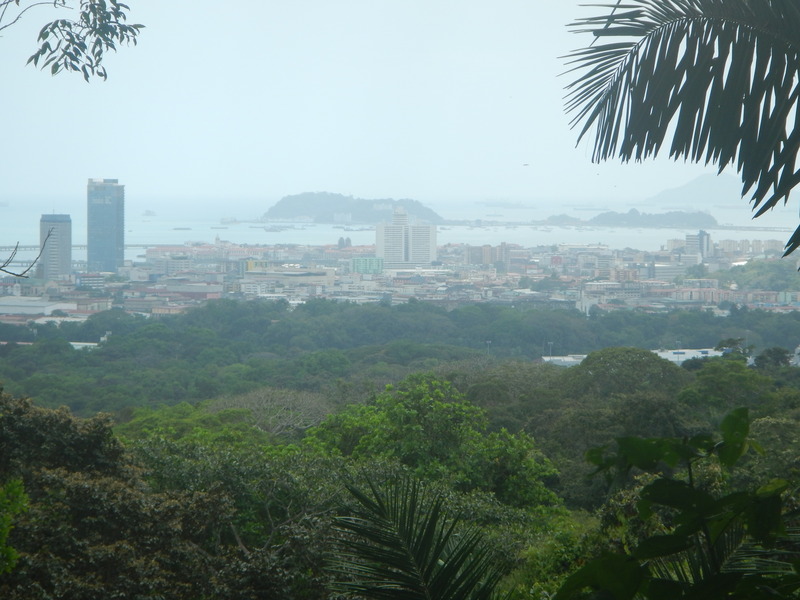 We went for a nice hike in the Parque Natural Metropolitano, a nice stretch of forest not far from the city which has views overlooking the Canal and also the anchorage where we managed to spot Lungta. Along the trail we saw numerous leaf-cutting ant trails, a blue morpho butterfly. a large spiky spider spinning a sticky web, and a papaya-sized (and -shaped!) 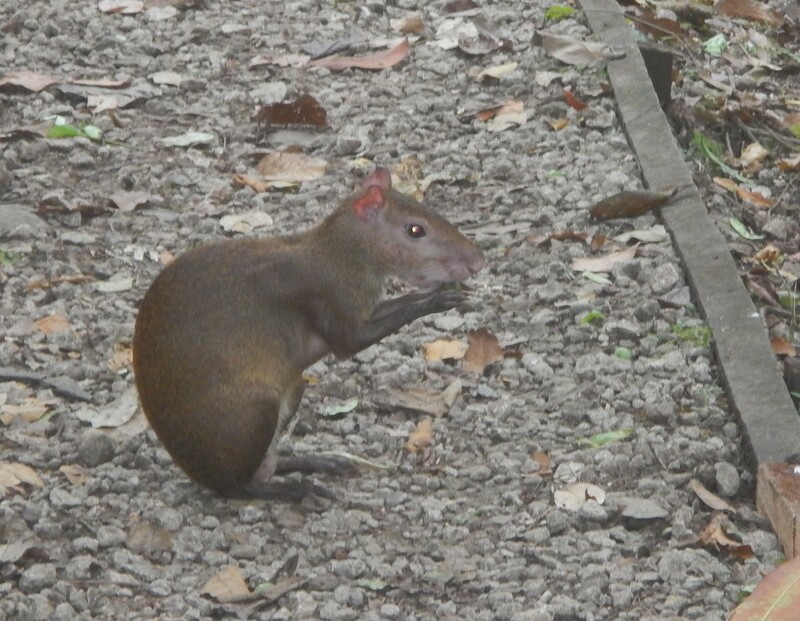 rodent locally called a ñeke. 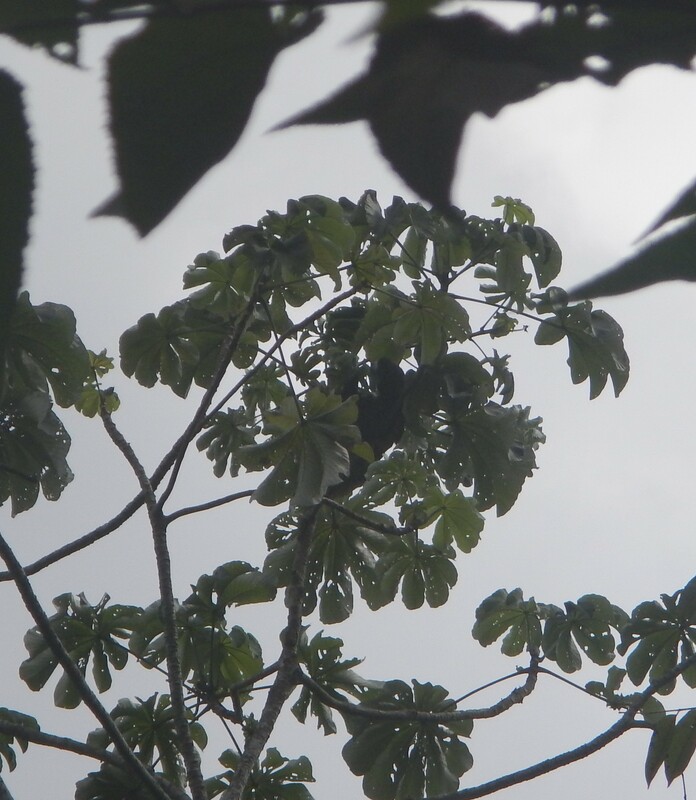 At the very end of the day we encountered a park ranger who pointed out a sloth to us. What a delightful find! We went from there to an artisan’s market that had a nice variety of local crafts, mixed in with a good sampling of tourist shlock. 🙂 Suz bought a nice mask (for her collection of animal masks) of a ñeke! We also wandered a bit through a local fair, never figuring out what the occasion was that was being celebrated, but enjoying the children playing in bubbles and the regional dancing that was featured. The next day we made a quick run to the local wholesale produce market, before she needed to head to the airport. The colors and smells of the various fruits and vegetables were a sensory pleasure, and it was delightful to come home again with our arms full. It was a real treat for Kathy to reconnect again with this “lifetime friend”! We talked about our shared history, our dreams, our current trajectories; it was a nice heart connection. We got an opportunity that Kathy had been hoping for for quite a while: to transit the Panama Canal as line-handlers for another cruiser. We met the owners at a pizza night for the cruising sailors. They had spent ten years cruising in the Pacific and were now taking “the shortcut” back to Europe. They invited us to join them, the following week. Dan wasn’t too excited, so opted to stay home on Lungta and continue working on some of our projects. But Kathy, Dave & Laura all were up for the adventure! A few days later we packed an overnight bag and joined them on their boat. They had a 5:15 appointment in the morning to pick up the Advisor near buoy #2. Although we went to bed fairly early, I don’t think anyone slept really well; we were all excited about the next day’s plans. The next day was a full day, not exactly crazy busy, but with things to do frequently throughout the day. When we called in the morning to confirm the time and place to meet the Advisor, we were instead told buoy #6 at 6:15 – so we had time for breakfast! Receiving the Advisor(s) was smooth – there were two, because one was in training and other was her mentor. We had a beautiful glimpse of the sun as it came up over the island that Lungta is anchored near (we were now on the other side of the causeway). There are 6 locks, 3 going up to the lake and 3 coming down afterwards. We were side-tied to another sailboat of a similar size, and there were also 3 big tugboats and a beautiful Mexican tall ship in the lock with us. 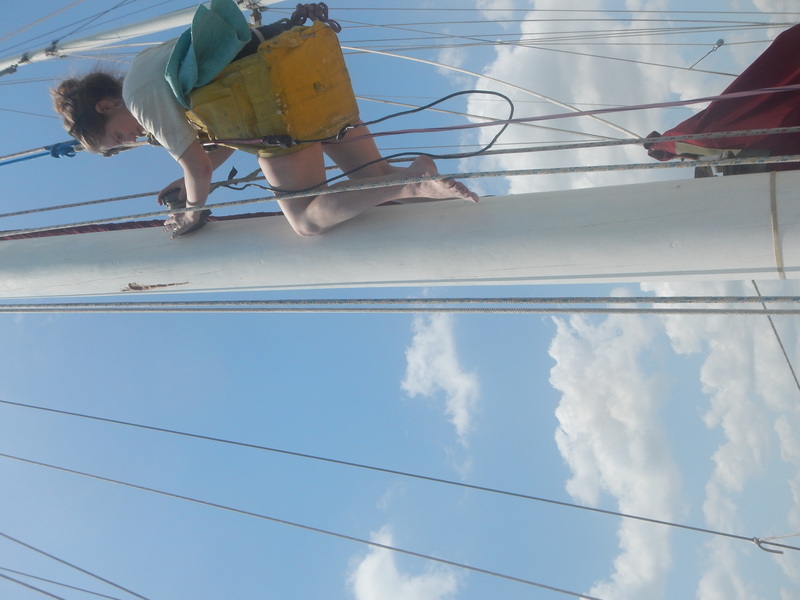 There were men up on the yardarms of the Mexican boat, some of them more than 75 feet above the water level. 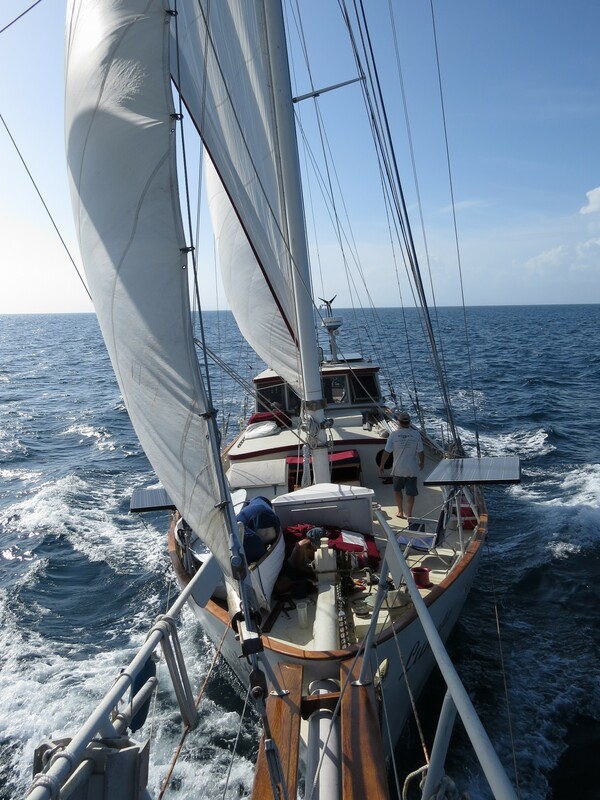 Dan & Kathy had toured this same ship, Cuauhtemoc, when we passed through Acapulco with Wayne and Keith on our way south. A few days later we ended up crossing the isthmus once again! We had just about given up on finding a place that could inspect and service our liferaft, when Kathy saw a commercial boat offloading theirs onto the dinghy dock and pushing it up the ramp. She hopped out of our own dinghy and asked the guy at the top where they were taking the liferaft. We contacted that company and a few days later they came to pick our own up. We asked if we could watch the process, and they agreed. So the next morning Kathy, Dan & Dave hopped on a bus back to Colon. We got a taxi to take us to the address that we’d been given, but it turned out to be more complicated than we’d expected. The servicing company was located inside the Duty Free Zone, which is surrounded by barbed-wire-topped walls and has guarded, limited entry. The taxi driver told us that we needed to pay the guard $20 – but not in front of the cameras! After a bit of a standoff, we called our contact at the servicing company, and he drove their company van around to meet us. Our guard settled for $5 and we were on our way. We got a kick out of seeing them unpack our liferaft. We’d bought it from a second-hand shop in California, and had never seen the inside. We were very pleased at what we saw. 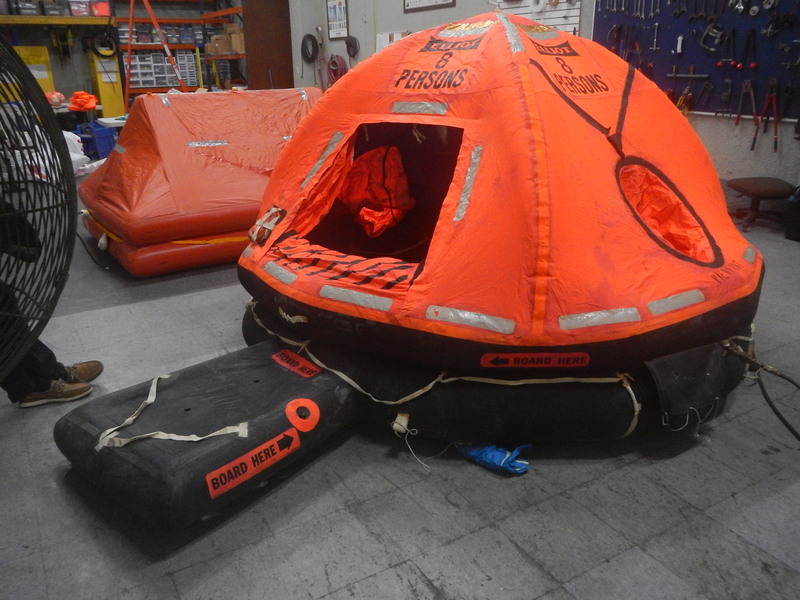 Although our life raft is quite old (manufactured in 1989), it is quite solid and in good shape. They checked that it would inflate, and checked all of the seams; they replaced the flares and first aid kit; they hydro-tested the CO2 cylinder and repacked everything up carefully again. The liferaft comes back to us along with the peace of mind that comes from knowing that you have a safety net. We’re busy, but we’re definitely feeling like we’re nearing the end of our gotta-do list! Hope life is full of promise and joy for each of you as well – and if it isn’t, then figure out what you need to do to make that so!